This building offers a variety of recently refurbished offices. 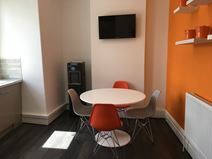 The work space comes with many fantastic amenities, including a breakout area, a functioning kitchen, onsite parking and a garden area. The WiFi can reach the garden area, perfect for meetings in the summer months. The office has stunning collaborative working spaces and also private meeting rooms. Located only three miles from Wigan Town centre this office space has access to main line rail networks. 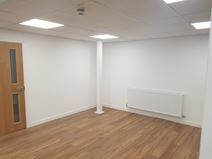 This building offers newly refurbished office suites located in Wigan town centre. The office suites range in size, from 177 Sq Ft to 477 Sq Ft. The space comes with a fantastic break out area with a fully functioning kitchen. With plenty of large windows the building is filled with natural light. The building is very accessible via Rail Network and also by road. Wigan Wallgate Train Station is locate a four minute walk from the building.